Natural wooden handbag mirror with cotton pouch. Cosmetic pouch with 7 makeup brushes for a professionnal makeup. The complete face and eyes makeup brushes kit! Cosmetic pouch with 4 must have makeup brushes for a daily natural makeup. The best of Bachca products in a beautiful gift box. A hair brush, 2 make up brushes and the mini facial cleaning brush to offer or to keep for you! 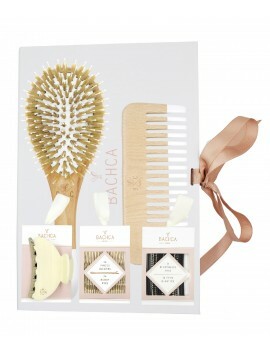 Perfect for wavy or curly hair, Bachca comb detangles by respecting your curls thanks to its wide tooth. Detangles wet or dry hair, and it’s the perfect tool for distributing product through your hair with ease. The BACHCA elastics are suitable for all circumstances, and are available in pastel colors adorned with a copper lurex thread. Very resistant, they are available in two thicknesses to adapt to all hair types. The soft colors will appeal to both adults and kids. The must have black elastics embellished with a golden lurex thread, is the ideal tool for an everyday hairstyle. Extremely resistant, they are available in two thicknesses to adapt to all hair types. The must-have hair accessory revisited in gold and ivory, it becomes the chic detail of all hairstyles. Ideal for attaching small rebellious locks or to create and maintain a bun. The BACHCA hair fork allows you to created beautiful hairstyles in no time. It is the ideal tool to make a stylish or messy bun, it helps maintain the totality of the hair while remaining discrete. 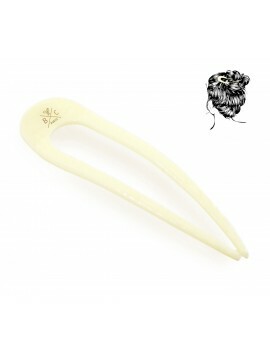 Declined in ivory, the hair fork becomes a hair jewelry. The BACHCA hair clip combines sober practicality and femininity. 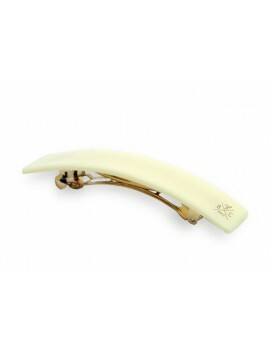 Declined in ivory and gold, the hair clip becomes a hair jewelry. The hair clips are available in two sizes and can be used to securely hold a bun or a half-tail. The BACHCA hairpin is the ideal tool for making simple and sophisticated hairstyles. Declined in ivory and gold, the hairpins become a hair jewelry. Its size allows to hold the totality of the hair.